Home » Fishing Blog » Tillamook Salmon: The Fall Run is On! Over the last few weeks there has been a change in the air out in Tillamook County. The mornings have gotten a little colder, there is frost on the grass, and we have even been given some small shots of rain, refreshing the region from a long dry summer; fall is here and with it come the Salmon of Tillamook Bay! Here at Lance Fisher Fishing we try to keep you up to date on everything fishing in the Northwest so follow us on Facebook, Instagram, and Twitter to stay in the loop on the fishing opportunities in your area! Tillamook Bay is filling up with salmon as I write this. This run starts in early September but really starts to pick up steam now and will continue to produce action through November. Tillamook Bay is unique in the fact that the rivers that flow into it have different run timings. Some rivers like the Trask are in their peak right now, while rivers like the Kilches will get fresh fish into December. 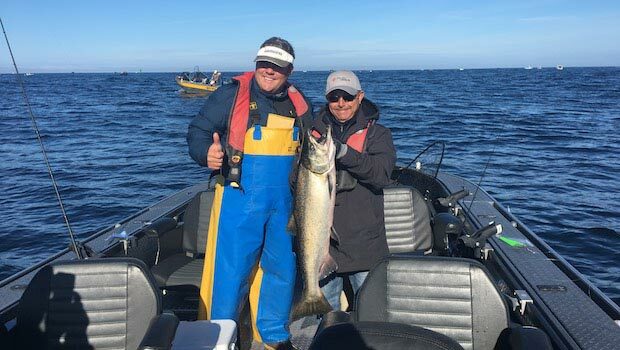 This means the Tillamook Bay season is long, with a steady stream of fish coming into the bay for the next several weeks. While some systems tend to see most of their fish leave the bay when the first big rains in October hit, the different run timings of Tillamook means not all the fish are gone after a big rain, many are still in the ocean and will come in at a later time. Tillamook Bay is known for its quality of fish. This is not to say other places we fish don’t have big Chinook salmon as well, but on average a Tillamook fish tends to run on the larger side. Tillamook bay also gets coho and chum salmon. While these fish are often overlooked because of the Chinook, they provide action throughout the day while searching for big kings! With the forecast showing nothing but sun, it is likely we won’t get our first big rain until at least mid October. Once this happens, we hop in the drift boats and pursue the salmon in one of the five rivers flowing into Tillamook. If the rain continues, we stay in the rivers, if the rivers drop we go back to the bay; being versatile is key in this fishery! Drift boat trips are a nice change of pace and offer a scenic and relaxing float down the river. For more information on booking a trip, where to stay, or even where to eat contact us at info@lancefisherfishing.com and we can point you in the right direction!